Another Versailles update: the Salon of the Grand Couvert has been restored to its past splendor, as part of the ongoing refurbishment of the entire palace. The Salon of the Grand Couvert is part of the Queen’s Grand Apartment. 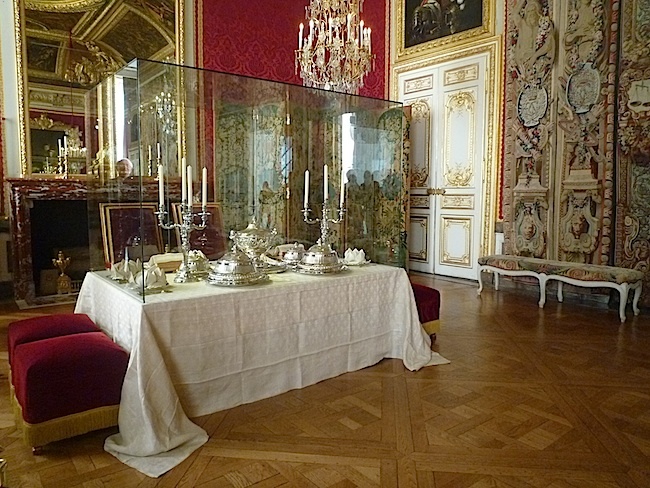 Couvert means place setting in French, and this is the room where the royal couple had dinner. The King and Queen sat on armchairs, facing the audience. Duchesses had the privilege of sitting on a row of stools arranged in a semi-circle a few feet in front of the table. Further away stoo the rest of the courtiers and the public, for anyone decently dressed was admitted to the palace. The Marquise de La Tour du Pin, who was a lady-in-waiting to Marie-Antoinette during the very last years of the Ancien Régime, attended these occasions. She notes in her Memoirs that “the King ate with a hearty appetite, but the Queen did not remove her gloves, nor did she unfold her napkin, in which she was very ill-advised.” Why ill-advised? Because the Marie-Antoinette, by refusing to eat in public, reinforced her image as an aloof and haughty sovereign. Not only did she hate the constraints of the étiquette, but she had little interest in food, did not drink wine, and only enjoyed her morning coffee and croissants. As explained in this excellent article (in French) in the Tribune de l’Art, the paintings and gilded stucco of the ceiling are restored originals, but the rest of this project is more an evocation than a true recreation of the room as it was in the 18th century. The crimson damask of the walls is modern, though based upon a period document. The tapestries and furniture were not originally at Versailles, but are authentic Louis XV pieces on loan from the Mobilier National (French national furniture collections.) The silver, of French manufacture, was ordered by King George III of England, and is also on loan from the Louvre. Sadly, very little of the original Versailles furniture survives. Most was taken to the Tuileries, in Paris, after the forced move of the royal family there in October of 1789, and was destroyed during the storming of that palace. Photographs courtesy of Didier Rykner and Anne Chauvet, © The Art Tribune.